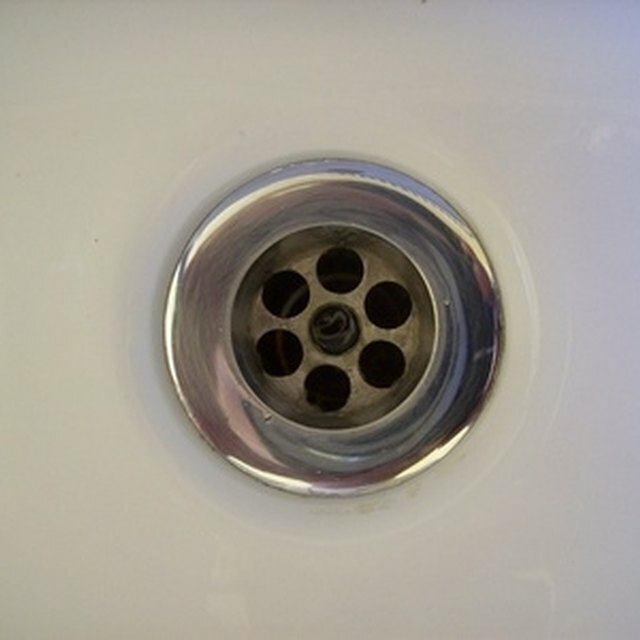 The bathtub drain lever, also called the trip lever, is located at the end of your tub above the drain. The lever raises and lowers a hidden stopper, which can release water from your tub or keep it in place. The lever connects to the stopper by means of a pair of stopper links. Because the lever is exposed to water constantly, sometimes they can rust and become stuck. When that happens, you'll want to repair your bathtub drain lever as soon as possible. Remove the two screws holding the overflow cover in place using a flat-head screwdriver. Remove the overflow cover. Do not pull hard because the drain stopper is still attached by the linkage. Pull the stopper out of the overflow drain tube. Examine the drain lever. If it is rusted or stuck in place, try to remove the rust with a wire brush. Lubricate the lever with silicone grease. If this does not work, you will have to replace the overflow cover and trip lever with a new one. Ensure that the stopper links are in good condition and free of rust or other weak spots. Replace if necessary. Make a note of the length they are set at so you can set the new links at the same length. Tighten the lock nut in place. Check the drain stopper. Clean off any gunk or debris. Lubricate thoroughly with silicone grease. Lower the drain stopper back into the overflow tube. Replace the overflow cover. Secure in place with the screws. If you need to replace components, PVC is a lightweight and inexpensive alternative.